The fighter jet hit the ground during takeoff due to a presumed "loss of power". 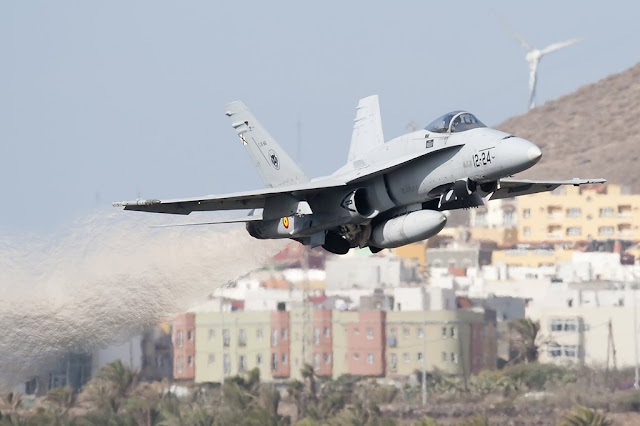 A Spanish Air Force EF-18A Hornet fighter jet assigned to 12 Wing crashed during take-off from Torrejón de Ardoz Air Base, few kms far from Madrid. The accident occurred shortly after 11 am local time, Oct. 17. The pilot Lieutenant Fernando Pérez Serrano, 26, was killed. The aircraft crashed inside the airfield just a few feet from the ground and the pilot was not able to eject. The causes of the accident are under investigation, a "loss of power" is the first hypothesis included in the list. According to a local source the aircraft technicians have warned a strange jet noise. The accident happened just five days after the pilot of a Spanish Eurofighter Typhoon was killed during the approach to Albacete Los Llanos Air Base after an air parade over Madrid (More details here).